Next month, the Senate is expected to take up legislation that would cap greenhouse-gas emissions. That fight began in blazing earnest last week, with a blitz of TV ads and public events in the Midwest and Mountain West. It seems that environmentalists are struggling in a fight they have spent years setting up. They are making slow progress adapting a movement built for other goals — building alarm over climate change, encouraging people to “green” their lives — into a political hammer, pushing a complex proposal the last mile through a skeptical Senate. Even now, these groups differ on whether to scare the public with predictions of heat waves or woo it with promises of green jobs. And they are facing an opposition with tycoon money and a gift for political stagecraft. Joe points to polls showing that there’s still majority support for climate legislation, and he’s right about that. But they aren’t big majorities, and they can get whittled away pretty quickly if — as Fahrenthold suggests — opponents start treating climate change the way they have healthcare reform. Which they will. There are two basic parts to their opposition. The first is the big picture, and everyone knows what that’s going to be. Just as warnings of a “government takeover” were the core of the anti-healthcare pitch, “cap-and-tax” is the core of the anti-climate pitch. It’s simple and effective, and it works because there’s a kernel of truth to it. Cap-and-trade will increase energy prices modestly, and that means electric bills and gasoline prices will go up for some people1. And as the poll accompanying Fahrenthold’s piece shows, electric bills don’t have to go up much for majority support to crumble. 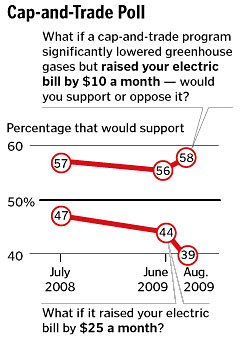 At $10 per month nearly 60% favor cap-and-trade. At $25 per month, 60% oppose it. Now, do you think the same people who were responsible for all those townhall shoutfests this month will have any trouble convincing people that $25 is the right number? Or $100? I didn’t think so. Are we ready for that? I’m not sure. But we’d better be, because the second part of the opposition’s message will be the little picture. In healthcare that turned out to be death panels and abortion funding and illegal immigrants. For the climate bill it will be — who knows? But it’s a long bill and there’s plenty to choose from. Maybe it will be scare talk about Wall Street getting rich by trading emission permits. Maybe it will be scare talk about China taking over the world because they get to keep polluting as much as they want. Maybe it will be culture war talk about how Midwesterners are paying a bigger price to clean up the atmosphere than all those chi chi Californians. I don’t know. But there will be plenty of it, and it’s going to flow through the same Fox/Drudge/talk radio channels as the healthcare stuff did. Are we ready for the street brawl to come on this? 1Yes, it’s complicated, because some people will get rebates and see their net energy costs go down. But that’s the whole problem: it’s complicated. Fox and Drudge and Rush aren’t likely to dwell on these nuances, are they?